SmarTrend can help you improve your stock market performance using our proprietary trend trading system. The SmarTrend trend trading system is based on over a dozen proprietary indicators and provides subscribers with stock trend forecasting for over 5,000 securities traded on the major U.S. exchanges and OTC/NASDAQ in real-time. When our SmarTrend system detects a trend change, our subscribers are notified in real time. You can see for yourself how accurate our stock forecasting has been. View our stock forecasting performance reports below to find out how our SmarTrend trend trading system can help you profit! See how SmarTrend’s stock market results and stock forecasting can work for you. Take the guesswork and emotions out of trading. Become a SmarTrend subscriber now and take advantage of our FREE 14-day trial. You will receive your login and password immediately — and then you have 14 days to use winning SmarTrend trend alerts for FREE! The SmarTrend Advisor trading tool provides open and closing signals for individual stocks it is trading. Performance metrics are based on it’s net asset value (NAV) for the dates shown below. SmarTrend is not a registered investment advisor and does not provide investment advice. This week, there are 1154 stocks in an UPTREND and 58.8% of these trends are winners with an average return of 7.89%. There are 3241 stocks in a DOWNTREND this week and 73.9% of these trends are winners, with an average return of 12.38%. This week, there are 1431 stocks in an UPTREND and 49.3% of these trends are winners with an average return of 5.02%. There are 2992 stocks in a DOWNTREND this week and 80.1% of these trends are winners, with an average return of 13.96%. This week, there are 805 stocks in an UPTREND and 70.80% of these trends are winners with an average return of 11.83%. There are 3584 stocks in a DOWNTREND this week and 71.37% of these trends are winners, with an average return of 9.95%. As the old "buy and hold" model is challenged in the current investing environment, active trading strategies have become increasingly important in order to both maximize returns and minimize losses. Using the SmarTrend trend trading system to know when your stocks are beginning a major trend, up or down, can make a significant difference and can impact overall performance. For many it is the key to how to make money trading. 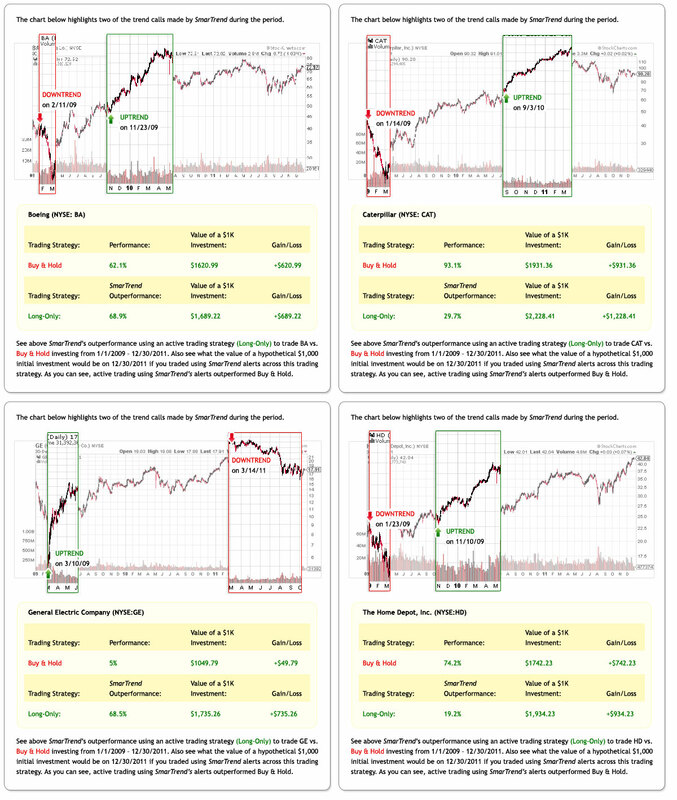 See above SmarTrend’s outperformance using an active trading strategy (Long-Only) to trade the DOW, S&P and QQQ compared to traditional Buy & Hold investing from 12/20/2011 – 6/4/2012. This study illustrates how trading with SmarTrend’s signals can be a way to improve your trading performance and generate outsized profits. Tired of making guesses about the direction of a stock? Need more relevant and reliable information? SmarTrend is the answer. SmarTrend’s market analysis software predicted the major market trends of 2011 with a stunning 87% accuracy rate. When SmarTrend identifies a potential trend, you receive the information immediately. Once SmarTrend confirms the trend, you can make an informed and profitable decision so you can always stay one step ahead. On July 29, 2011, SmarTrend called a Downtrend on the Dow and by August 31, 2011, it fell 10.2%. On October 11, 2011, SmarTrend called an Uptrend on the Dow and by November 22, 2011, it gained 7%. On July 18, 2011, SmarTrend called a Downtrend on the S&P 500 and by August 31, 2011, it fell 13.2%. 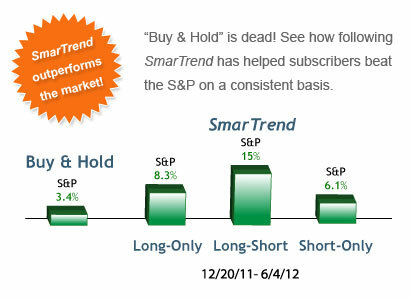 On October 11, 2011, SmarTrend called an Uptrend on the S&P 500 and by November 21, 2011, it gained 7.4%. SmarTrend takes the guesswork out of trading and gives you all the information you need to trade like a professional. Find out what SmarTrend is predicting now! Signup for a FREE trial of our SmarTrend trend trading product and get alerted to trend moves the moment they occur!